Life, Liberty and the Pursuit…… – It’s Only a Number « MLB Musings with Michael – Look Who I Just Interviewed! 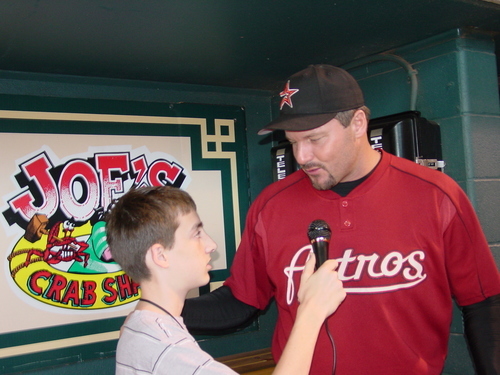 16 – The number of minutes Rusty Harding, the attorney for Roger Clemens spoke at the press conference opening. All this business with Roger Clemens and steroids got me to thinking. Depending on what side of the fence you are on, he’s either telling the truth or not. Many reporters make the case he’s guilty. Few defend or buy into his innocence. The Mitchell Report brought to light the seriousness of steroid use in the sport I love. I love baseball. I love everything about it. I always have, and always will. But steroids are ruining the game, and those who choose to take them. Pro athletes set the example for their young fans, and it’s time they started taking responsibility for their actions. Taking steroids sends the message that they are ok. They aren’t. Young athletes believe steroids will make you run faster, heal faster, last longer. They look at the successes their idols have, and the lure of athletic scholarships or a pro career is irresistible. In their minds, the gains outweigh the risks. Steroids aren’t fair. They give the person who uses them the unfair advantage over someone who trained and worked hard the right way. They’re wrong, and don’t belong in any sport and makes the legitimacy of records questionable. With all that said, I feel bad for Roger Clemens. He has accomplished so much in his career, worked hard, given back, and regardless, the doubt will always follow him. The presumption of innocence – being innocent until proven guilty – is a legal “right.” “Rights” belong to each of us individually and cannot be taken without our consent. We forget this way too often. The First Amendment gives us free speech. We can say whatever we want. The truth is protected even when its expression damages the person to whom it applies. This freedom of speech also includes freedom of the press. But, there are some forms of speech that are “conditionally protected.” If a written statement is made in “reckless disregard for the truth” and is considered damaging to the victim, it can be punished as libel. If the statement is oral, it can be punished as slander. So what exactly is the truth? An individual is innocent until proven guilty. A story can sound true until the other person has the chance to tell their side. Clemens has done so. After hearing all of the evidence, there should be no reasonable doubt that the accused individual is guilty of the charge. Clemens has disputed the claims by McNamee repeatedly. The first Amendment gives us the right to say anything, and while I support free speech, the burden is often on the accused to prove their innocence. I hope Clemens is telling the truth. I need for him to be telling the truth. I need to believe there is honesty left in the game. We may never know the complete truth, but until proven otherwise, he deserves to be heard. Will the steroids scandal keep Roger out of the Hall of Fame? That’s something we don’t have to worry about for at least five-years. Right now it’s one man’s word against another. There are a lot of legal questions that haven’t been answered so we have to give him the benefit of doubt and not rush to judgment. The upcoming Congressional hearings should be very interesting. In case you were wondering, next to baseball, my passion is politics and government. To quote Thomas Jefferson, “If ever you find yourself environed with difficulties and perplexing circumstances, out of which you are at a loss how to extricate yourself, do what is right, and be assured that that will extricate you the best out of the worst situations.” Great advice. I also hope this unpleasant experience will make others think twice about the risks, not only to their health, but to their careers, their integrity, the game, and the examples they set for others. Former track star Marion Jones is the perfect example. For lying about her use of steriods, she recently received a stiff sentence and jail time. The judge made her an example as a warning to other athletes. With that said, anyone else ready for spring training?